Wanting just to drink a beer and read my Boston Globe, I was tormented all afternoon by shouts and commotion from the street next to my sidewalk cafe. Could it be serious road rage or another big ball of fire in the sky? 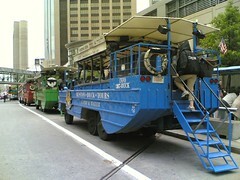 Nope, just another annoying Boston Duck Tour. While it seems that the tours get good reviews, I really wanna question the sanity of anyone who partakes in one. Besides the whole tour group tourist aspect of riding around town sardined with 20 flyovers, zipping by sights without even walking around, I know I’d be homicidal if asked to do the damn cheering they bombarded bystanders with on its route. Wait, any chance one of these things sank in last Sunday’s freaky windstorm weather? I can only hope..
oh c’mon, lighten up and give’m a friendly quack! Isn’t Boston “the hub” of friendliness? And good, old-fashioned cheery spirits?! Hoist that beer high to welcome our out-of-town friends with a KAH-WAK! I think those people in the pic are getting on the boat rather than off … Duck Tour suppositories perhaps?